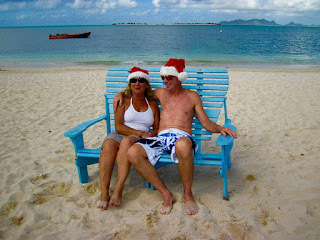 Merry Christmas from Carriacou, Caribbean! 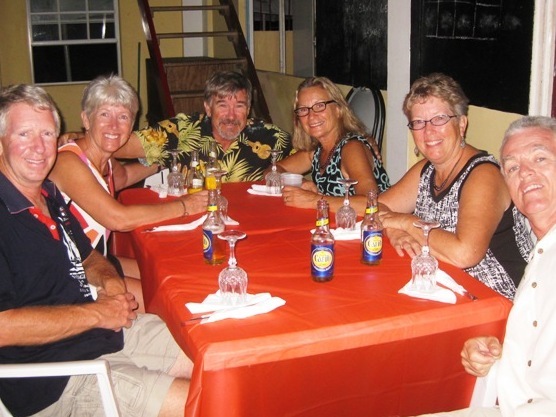 Christmas party in Carriacou with Steve, Dawn, Brian, Maria, Lorna and Laurie. 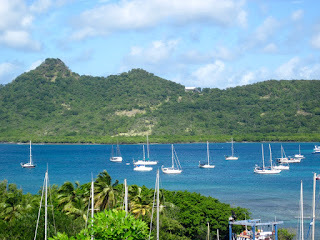 Carriacou anchorage. Aspen is in the center of the picture with the two sails in front of the mast. Maria enjoying being on land. It’s Christmas in the Caribbean where we’ve got everything but SNOW. Palm trees bend in 25 knots of wind while three foot waves in our anchorage pound against Aspen’s clean and well washed hull from all the rain squalls erupting overhead. Ahhh, the tropics don’t get much better than this. 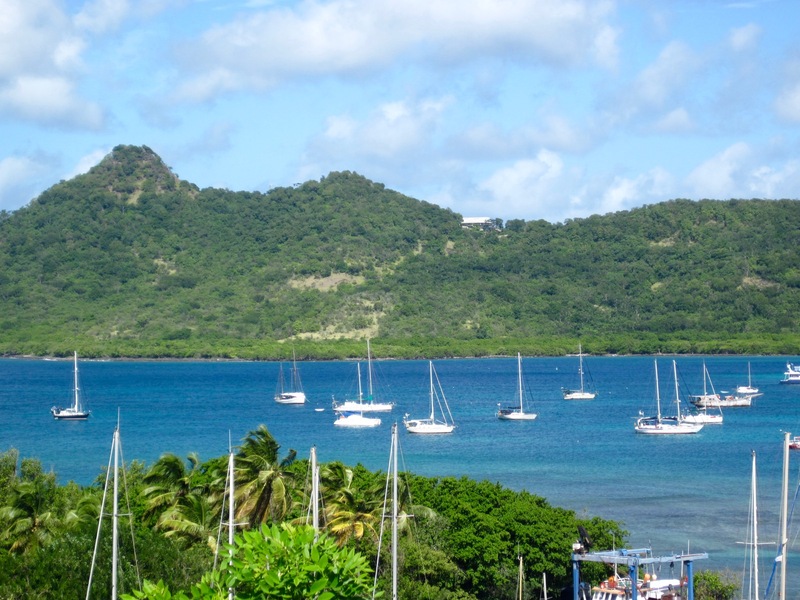 They are called Christmas Winds for a reason down in these little latitudes and that is what we now have here in Carriacou, West Indies. It is a festive time nonetheless. We shelve our log book for a Merry Christmas where sailors revel on the dock and wish each other well along with a toast of rum to King Neptune. Aspen sways on her anchor while Maria and I dance barefoot in the sand beneath the brilliant stars that brighten the night sky. Well, Steve kind of dances but runners only pretend to know what they are doing. Maybe it is just too much salt water on our brains, but you know, from Admiral Maria and Captain Steve: Merry Christmas to one and all wherever you may be and we hope you have a joyous and festive holiday season. 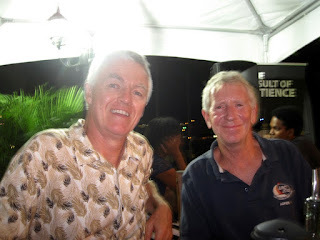 My friend Brent Weigner flew in from Wyoming to run the Grenada Marathon. 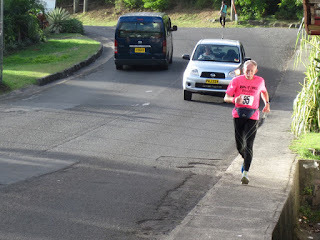 It is the 95th country he has run a marathon in. What a runner! 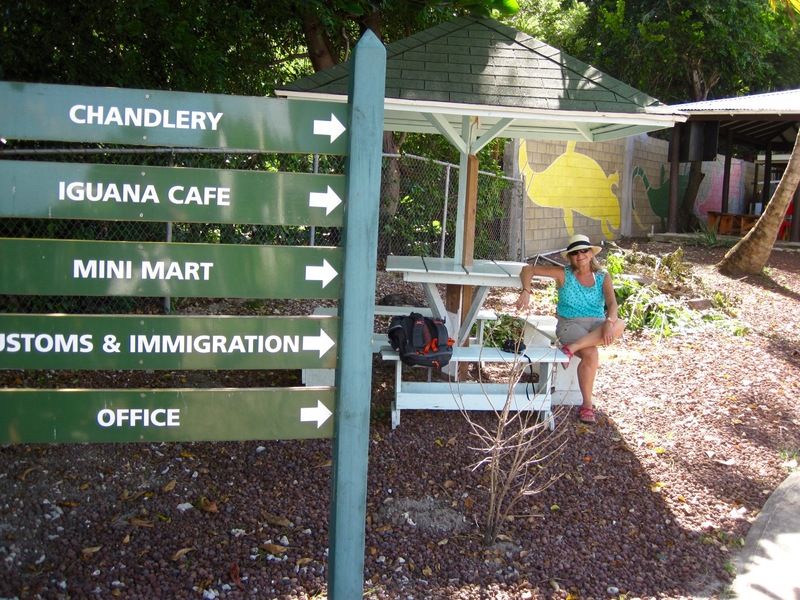 Maria arriving at the Amerindian cave on Grenada. Wow. 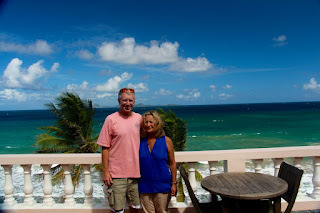 The north coast of Grenada at Petit Anse, looking northward. Carib Rock art. 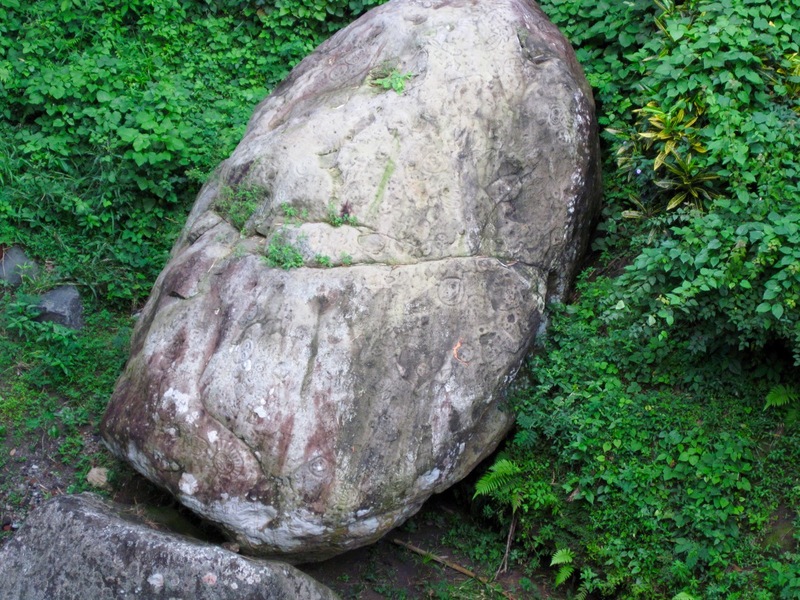 The boulder is approximately 10 feet high and lies along a river in the north part of Grenada. 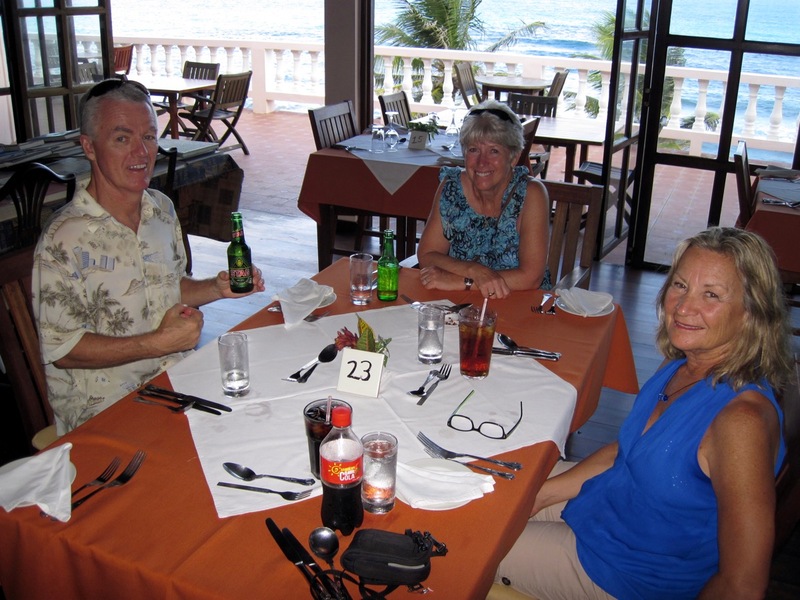 Lunch break during our travels around Grenada with Laurie and Dawn (Cat Tales) and of course Maria. 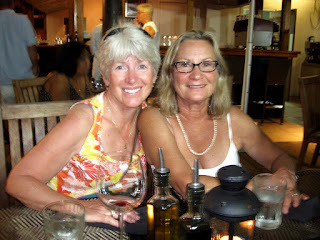 The girls, Dawn and Maria, taking a break from boat work. The guys, Laurie and Steve, also taking a well-deserved break from boat chores. Aspen is floating, once again, in the warm turquoise waters of the southern Caribbean Sea. Maria and I arrived in Grenada, island of the spices, a little over a week ago from snowy and cold Colorado. Clearing with the Customs man at the airport proved to be a non-issue for us, luckily. The horror stories from other sailors did not bode well to easily transport our 2 large bags of parts past the watchful eyes of the tax man. But we had a plan, of course. Maria and I dressed as normal tourists and not as sailors, with our destination the nice upscale resort of Sandals (not really where we were going but it looked good on paper). 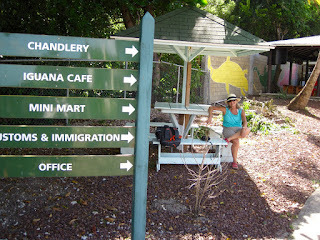 One look at us and hearing our intended destination the customs man could not get rid of us quickly enough. No exorbitant duty fees were assessed nor were we hassled upon our arrival. Success! Seeing Aspen waiting for us on land again is always special. The past 10 days have been a whirlwind of activity. Aspen accumulated more dirt and mud on her usually sparkling decks than ever before. Scrubbing, powering up the various systems, putting Aspen into the water and then motoring for 1.5 hours to a marina in St. Georges, Grenada kept us very busy. The tropical heat caused Maria and I to move slowly until we became acclimated to living, working and sleeping in 85 degrees day in and day out. We eventually caught up with our Canadian friends on Cat Tales, Dawn and Laurie, and shared a rum or two once again. Maria and I desperately needed a break from all the work and rented a car to drive around the island, looking for elusive archaeological ruins and a nice place for lunch. Of course Grenada is x-British so driving is a challenge with the cars built for English road rules and everything on the opposite side when compared with our North American driving skills. The Cat Tales crew were persuaded to join us on our tour (Steve needed another set of eyes to help with the navigation too). 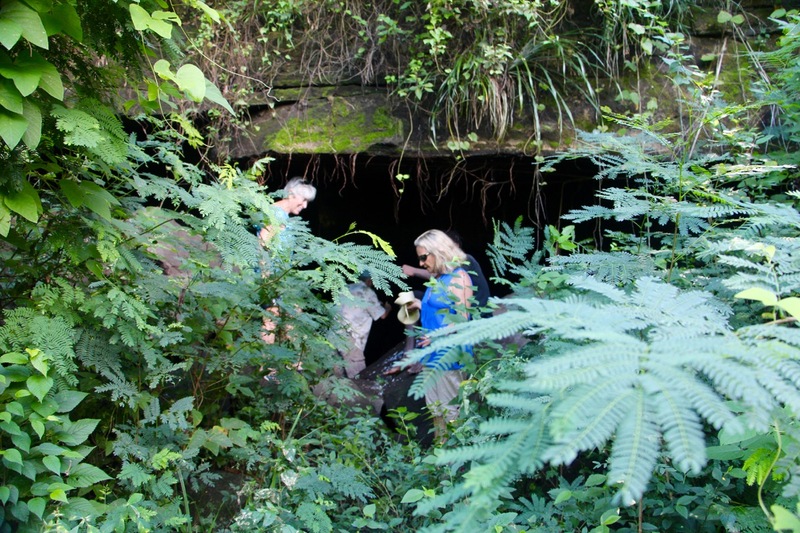 We saw an X on the map that said Amerindian cave so that became a priority on our tour, at least for Captain Steve. The muddy, slippery road we had to walk down was a nice journey to find the elusive cave. Unfortunately the old road ended and it was time to walk on an indistinct path through the bush and next to a very wet stream. Luckily we found a local man named Dillon who was fishing in the stream with his mother. 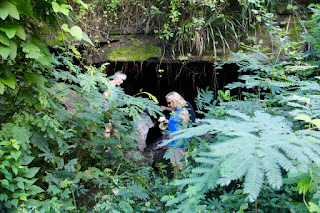 Dillon became our guide and led us through the jungle, climbing a muddy, steep, semblance of a path and pulling Maria up as well before encountering an opening in the towering cliff above us. The cave magically appeared and we were successful. The cave was an excellent place for ancient peoples to live, along with bats that whizzed past our heads in the darkness. Fire ants seemed to like the cave floor as evidenced by Maria and myself having our feet chewed on in the darkness. For some reason Dawn and Laurie escaped their bites, luckily. The cave was quite large with a second opening to the sky around a corner and further inside. It was truly a magical place to find, thanks to our guide who deserved the tip both couples gave him when we were safely back on flat land again. Petroglyphs (Carib rock art) were explored beside streams and beaches during our journey along with a great lunch on the north coast of Grenada. We arrived back on Aspen before it was too dark; muddy and tired from a successful tour. This new week will see Aspen sailing north to Carriacou, a larger island 20 miles to the north of Grenada proper. It will be nice to be under sail again with the squalls, seas and strong winds pushing us on our way.